This seven-piece dining set is simple, yet classic. 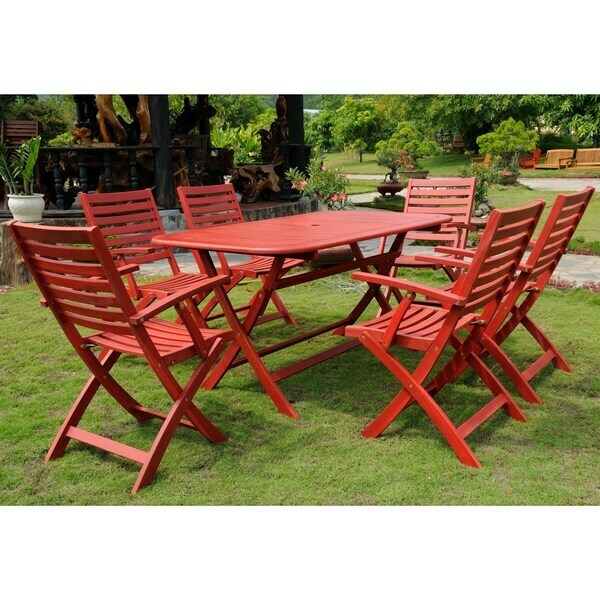 Made of wood and perfect for outdoor entertaining, this wood dining set folds, allowing it to take up a much smaller space during storage. Available in three colors, this set matches any home while adding functional style. This set is weather resistant so it holds up in the rain. I've received a lot of compliments on this set. The chairs are comfortable and fold for easy storage. The table came with one screw missing and a scuff on the end. 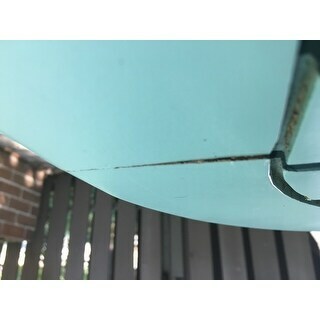 The table was replaced within a couple weeks. The dimensions and color shown are accurate. Great buy! After purchasing as a set, I did see that you could buy the table separately and chairs separately (some with arms and some without). Arrived with worm holes and wood is splitting. We purchased this set for our outdoor patio. It is covered by an umbrella. Description says it can be outdoors. 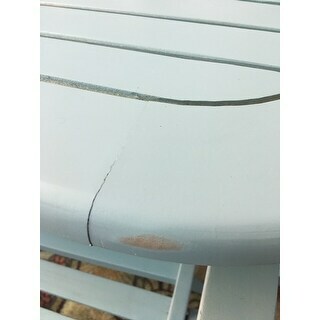 After less than two weeks outside, the corners of the table have raised up at the seams creating an uneven surface. The stain/finish is not evenly applied leaving worn looking spots. The table and chairs are sturdy however. Contemplating a return. bought this last summer,looks great every easy to store away in winter. The table is a little small for six chairs,but only needed for anyways. One of the chairs arrived with a broken rung, Overstock supplied a new chair to remedy the issue. Good set for value. 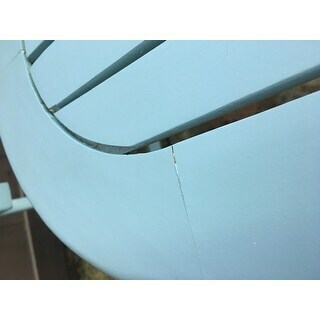 Two slats on two different chairs broke within a week. It is not solid wood and NOT durable. Returned, arrived with broken pieces, replacement sent, different pieces broken this time. Received refund. "We have this set and need another chair. Can we just buy a single chair??" Please see item# 16017076 for a set of 2. At this time single chairs are not available. "What is the difference between this and the Milazzo set?" Table folds and chairs have arms. "Is this more of a aqua blue or baby blue?" Hello spraywad, the color appears more baby blue in my opinion. We try to represent the colors of our products accurately. Unfortunately, due to the difference in monitor colors we cannot guarantee that the color will match exactly what you see on your screen. Thank you for shopping with us. "Can these stay outside in a rain? It's hard to tell if metal parts are corrosion resistant- they do not look stainless"
Hello Igor O., this item can stay outside in the rain as well. Thank you for shopping with us. loved the color and the fact that it can fold and be easily stored! I love that's it's wood, and love the idea of being able to fold up chairs and store in the winter. And I love the color. "What is the seat height of the chairs?" Hello hhoverton, the seat height from the floor to the top of the seat is 17 inches. Thanks for shopping with us!